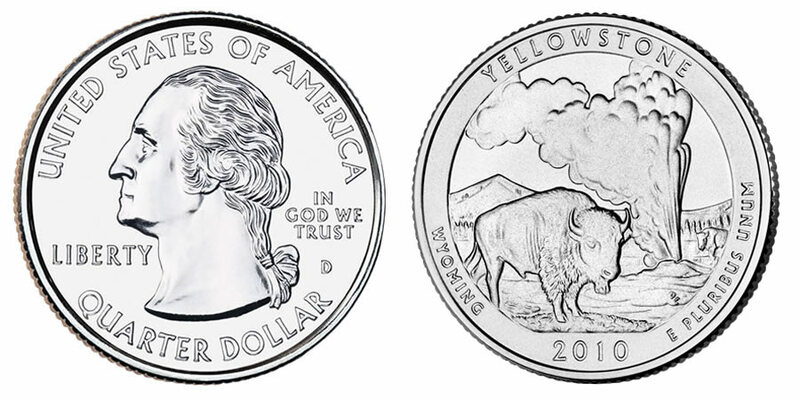 The US Mint's second coin in the America the Beautiful Quarters Program will be the 2010 Yellowstone National Park Quarter. It honors the site in Wyoming that was the first in the nation to become a National Park. In 1872, legislation was signed creating the park with an aim to protect its resources for generations to come. Known for its beautiful scenery and wildlife, it is the thermal features of the region that has made the area known worldwide. Probably the most famous example of one of these features is the 'Old Faithful Geyser' which erupts with uncanny regularity and draws millions of visitors. Today the park encompasses over 2.2 million acres and is home to hundreds of species, several of which are threatened or endangered. The Mint will also be striking three inch diameter .999 fine silver quarter dollar bullion coins as part of the program. Each bullion coin will contain the same design as the circulating coin. The John Flanagan portrait of George Washington is featured on the obverse of the quarter along with the words "UNITED STATES OF AMERICA," "QUARTER DOLLAR," "LIBERTY", "IN GOD WE TRUST" and the mintmark. The reverse was designed and engraved by Don Everhart. It shows a buffalo standing in front of the Old Faithful Geyser. 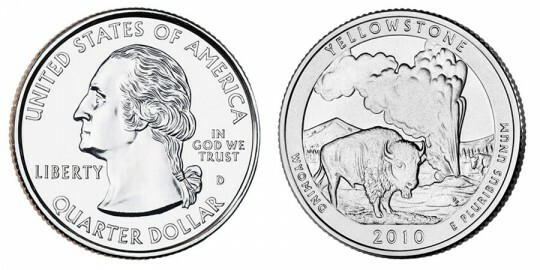 Also shown are the inscriptions "YELLOWSTONE," "WYOMING," "2010" and "E PLURIBUS UNUM."